The Yellow Buglite from Overdrive provides yellow wavelength in which the visibility for bugs is minimized, resulting in providing a Bug Free environment around the lighted area. This lamp is suitable for use in enclosed outdoor fixtures. 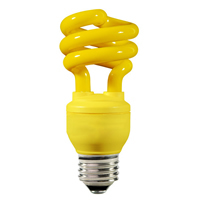 This 13W T2 CFL buglite replaces 60W A19 incandescent bulb.